On Thursday morning from 6-9 a.m., The Smiley Morning Show will be heading to The Shops at Perry Crossing, formerly Metropolis Lifestyle Center, in Plainfield for their Pumpkin Drop. There will be trick-or-treating, a photo booth, and of course -- a pumpkin drop! 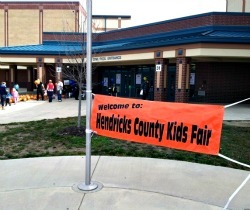 For great family fun that helps a good cause, be sure to check out the Hendricks County Kids Fair from 1-4 p.m. Saturday at Avon High School, 7575 E. County Road 150 South in Avon. There will be live music, games, free refreshments, bounce houses, face painting and more. This free event is sponsored by Prevent Child Abuse of Hendricks County. If you&apos;re looking for some fall fun with your canine friends, be sure to head to Beasley&apos;s Orchard in Danville for their annual Dog Daze at the Maze. You can explore the corn maze with your pup while helping to raise funds for local animal charities. There will even be adoptable animals on site if you&apos;re looking to add to your furry family! This is also the last weekend you&apos;ll be able to check out Haunted Hargrave Hall in Danville. Come see for yourself on Saturday if this old gym is truly haunted! Lights on hours start at 5 p.m., but if you&apos;re truly brave, come after 7 p.m. to experience the gym in the dark. Here&apos;s a little more info about the haunted legend behind Hargrave Hall. As always, you can find more great things to do on our Events Calendar. Whatever you do this weekend, be sure to head out and enjoy Hendricks County before the fall beauty ends for another year!